Winner of the prestigious MRS Awards 2013, Healthcare category. The MRS is the world’s largest research organization with a presence in over 60 countries. ‘Detail Aid’ testing has been a staple of healthcare market research for many years. Sometimes called ‘Detailers’, often ‘Sales Aids’, Detail Aids are effectively short ‘Product brochures’ that Pharmaceutical Sales Reps use to explain the features and benefits of their products to Health Care Professionals (HCPs). They are a key tool used by the healthcare industry to generate product awareness and sales. Traditionally detail aids have been tested in a routine manner, the HCP is taken through the document page by page and their thoughts are gathered on the quality of the content and clarity of message. This approach can often mean that the final product is a 20 – 30 page document with too much explanatory copy and limited visual impact. Working in conjunction with Bausch and Lomb, the eyecare experts, Kadence International USA has developed a new methodology to test, refine and improve detail aids and ensure they are successful in their intended purpose – to effectively support the sales representative and ultimately help them to sell. The Detail Aid being developed was for a new Contact Lens which was manufactured using a new material. Given that this was a completely new contact lens with a totally new set of attributes, it was important to effectively educate and communicate the benefits of lens and to gain buy in – all within the limited time available. The Detail Aid is not tested by a researcher interviewing a HCP but by a Sales Rep pitching the product, using the Detail Aid, for 15 minutes. The 15 minute ‘pitching slot’ is no accident; it is the standard length of time a Pharmaceutical Sales Rep has whenever they call on a HCP for a visit. The research technique therefore acknowledges that a Detail Aid should not be tested under a microscope in isolation, but in an environment where it is an extension of a natural 15 minute HCP-Rep interaction. The approach encourages buy-in from all stakeholders and heightened levels of commitment to making the product a success. The Sales Rep used in the research is real, selected from the sales team to help develop the Aid. They help to credibly pitch the stimulus, but they also observe the market researcher debriefing their sales pitch from behind the mirror – so they get a firsthand view of how their sales pitch was received. In these observation sessions the Sales Rep and the research team discuss places in the pitch where the Rep may have struggled and discuss how it could be altered. These alterations include suggested changes to the Detail Aid as well as testing adaptations to the pitch in terms of words, phrases, or the overall flow. Used to cut-through the ‘poker face’ atmosphere that occurs in any seller-buyer exchange. We use observation through the one way mirror coupled with direct questioning in the debrief to collect feedback about the Detail Aid, but we also cross reference this with Facial Coding and Heart Rate analysis to identify key moments in the sales pitch that generate positive emotion. In addition, Heart Rate monitoring is a highly effective and unobtrusive measure of emotional connection that can be collected in real time, allowing the moderator to identify emotional moments and probe on them during the ‘debrief’ session. Respondent’s heart rate is automatically captured using a Bluetooth enabled wrist worn heart rate monitor and displayed on an iPad application developed by Kadence. The app uses an algorithm to determine the overall intensity of emotional response to the sales pitch and identify significant emotional events that occur through the course of the sales call. The time stamp of these events is cross referenced with Facial Coding to objectively identify if the emotion experienced was positive or negative. Lastly the emotional event is cross referenced again with the voice and video transcript to identify the content that triggered the event. 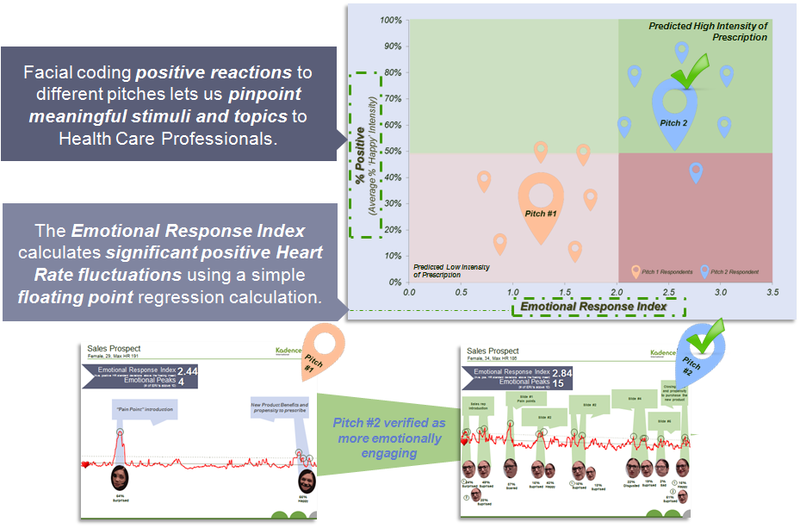 This gives us an emotional map of each sales pitch, measuring the number of positive vs negative emotional moments experienced, and identifying the message and visuals that generated each emotional event. Through successive respondent interviews we identify how to remove negative emotions and layer on positive emotions to produce a winning pitch supported by a winning Detail Aid. 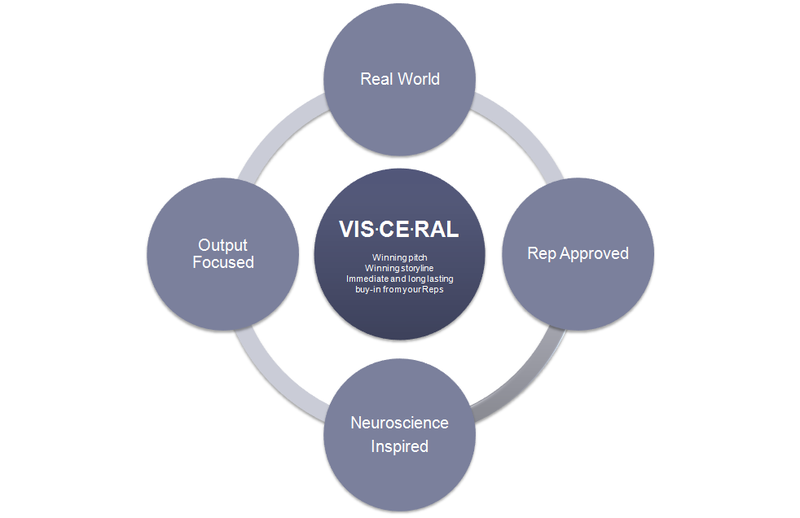 Following this approach a Detail Aid was developed that allowed the product to be pitched with a compelling story that clearly communicated features and benefits which would convince the HCPs to trial. The results of the research have been truly inspiring. Since its launch in late 2012 the lens has been the most successful lens product launch for Bausch & Lomb in over a decade. Bausch & Lomb have since commissioned two more of these Detail Aid Projects with Kadence International USA for their next two product launches in 2013-2104. Or, read our 3 Lessons from Neuroscience one pager to learn more about creating great sales aids.